Early preparations for this vacation included getting passports for Jeremy and Katie Beth, as well as a passport renewal for Elizabeth. We also booked our flights and car rental online several weeks in advance of our trip. On Wednesday, August 8, 2007, we awoke about 4am to drive to the Houston airport to catch a 7am flight to Detroit. Upon arrival in Detroit, we grabbed our bags, caught a shuttle bus to the car rental agency and picked up our reserved SUV for a short drive north to the Canadian border at Sarnia. After a brief stop for clearing customs, we drove north through Ontario for about 6 hours to Tobermory. Gasoline prices in Canada ran between 95 and 99 cents per liter. After eating dinner and loitering briefly in Tobermory, we caught the 8pm ferry boat (called Chi-Cheemaun) to South Baymouth on Manitoulin Island. We spent the night at a motel located within walking distance of the ferry dropoff location. After a long day of travel, we were tired and slept in until about 9am the next morning. We finally got checked out of the hotel at 11am and hit the road for a short 90 minute drive to Camp Adanac near Evansville, Ontario. The roads on Manitoulin Island are not very well marked and despite our scrutiny of maps and AAA Trip Tic, we missed several essential turns. We finally arrived about 20 minutes later than planned due to the round-about path we took to get there. Maps from Google Earth that show where we went. We landed at the Detroit Wayne County Airport. We drove north through Detroit to enter Canada at Sarnia. Aerial photo of Lake Huron and Manitoulin Island. Tobermory, Ontario, from where the ferry leaves for Manitoulin Island. South Baymouth on Manitoulin Island. Finally at Camp Adanac, we unloaded our luggage and set our sights on typical vacation activities, such as setting up our cabin, goofing off at the beach, riding a golf cart around the premises, hiking, bird watching, visiting with others who were also there to visit with Marjean and Tap. 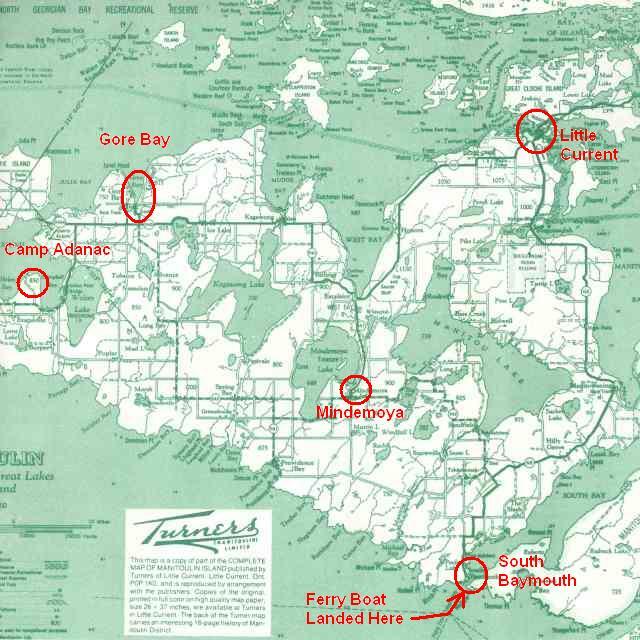 One day we drove into Gore Bay, to pickup some essentials... like groceries, beer, and a minnow net. We learned that the currency exchange rate from U.S. to Canadian dollars is much better at the liquor store than at the local Gore Bay branch of Bank of Montreal. During our stay at Camp Adanac, we also visited with several of Tap and Marjeans friends and some former camp personnel, including camp counselor Amy (and Sean) and camp nurse Wilma (and husband Brian). A collection of several slideshows of our adventures on Manitoulin Island are attached below. Ferry Boat Ride on the Chi-Cheemaun. General Pix around Camp Adanac. Our Cabin at Camp Adanac. Water Sports in the Bay. Trips into Gore Bay, Ontario. Scenic shots of the island shoreline. Tap and Marjeans Bayhouse INTERIOR. Tap and Marjeans Bayhouse EXTERIOR. After 6 days of goofing off with family and friends, it was time to say 'goodbye' and leave Camp Adanac. We drove back to South Baymouth and caught the 12:30pm ferry (same Chi-Cheeman boat) going back to Tobermory and drove another 6 hours back to Sarnia, Ontario. We cleared customs late that night on August 14 and spent the night in a hotel in Port Huron, Michigan. The next morning, Tom and the kids caught the free continental breakfast while Elizabeth slept in late and then was surprised to learned that she couldn't take a shower because of a water main break in the building. Water had been shut off to the entire building. The hotel eventually had the pipe break fixed and Elizabeth could finish taking her shower. We checked out about 12:30pm and drove about 2 hours to the Detroit airport. We topped off our gas tank and turned in our rental SUV near the airport. We caught the shuttle bus back to the airport and after getting our luggage checked and getting ourselves through airport security, we ate dinner at some food vendor in terminal A, before meandering through the psychedelic underground tunnel to terminal B. We boarded our plane, endured the 3 hour flight back to Houston, changed our watches back to central time zone and finally arrived home about 8pm. Overall, it was a very pleasant adventure. We also got to escape the 100-plus degree temperatures that prevailed throughout the Houston area while we were gone. The only downside that I can recall, was that the stock market took a major tumble while we were gone, and Tom was not able to do anything about it.